Brows for Everyone! Eyebrows can really make or break your whole look. Eyebrows are such a distinct part of your face. Without them your face loses all dimension and expression. Eyebrows come in all shapes, colors and sizes. 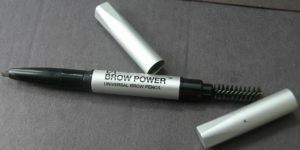 It Cosmetics makes the best pencil to fill in your brows! We are adding more services for your eyebrows to the salon. We can help you design the perfect shape, tint them a gorgeous color and maintain them for you. Check out our website for a list of details and prices for Beautiful Brows! www.BrookeRockwellHair.com. Do you have piles of makeup like me? Maybe piles of expired makeup. I don’t remember when I bought some things! Makeup does have a shelf life and can expire. Has your makeup expired? I know I have lots of little cosmetic bags stashed under my sink with free samples and half used bottles of everything. Using expired makeup that’s passed it’s prime can cause breakouts and irritate your skin. Foundation in liquid form can be kept for up to a year. You must keep it out of extreme light and heat. It’s best to not use your bare fingers over the top of the bottle. Use a clean brush or sponge. I think if you wash your hands really well before you apply your makeup that would be fine too. If your hands are not clean the bacteria can be transferred into the bottle. Lip gloss and lipstick are less likely to grow bacteria. Most are safe 6 months to a year. Mascara and liquid eyeliner have the shortest life. Replacements are suggested every 3-4 months. Every time you take the wand out and back it back into the container you add more bacteria. Products that you use around your eyes are the most important to keep bacteria free. Powder eye shadows and blushes will last about 2 years. It’s always best to clean your brushes regularly so you stop the growth of bacteria. You can buy special makeup brush cleaner, but I always use a little of my shampoo. If you have an eye infection or cold sore you should get rid of those products right away. You don’t want to reintroduce the bacteria to your skin or eye. You certainly don’t want to use makeup from someone else ever. Brooke is an absolutely amazing hairstylist! I am from the Boston area and was visiting Pittsburgh for a formal event. I did a bit of research, and made an appointment with Brooke. She was wonderful! Great service, great salon, and she does gorgeous work for her prices. Her updos are so classy and elegant! If I ever travel to the area again, I will definitely go for another visit! Wonderful work, Brooke! Thanks again for making my night so special!